Bindlach, 20 June 2018. NKD presents its new Online Shop: The new shop-system attracts by optimized visual and functional properties. Customer satisfaction comes first for NKD. This is why from now on the NKD Online Shop shines in a new design. The textile specialist from Bindlach modernizes and optimizes its online appearance and thus takes the offensive, to act even more forward-thinking in future. The new visual and functional development also includes mobile use. NKD customers can look forward to the new look and feel of the NKD Online Shop. Thanks to the restart customers can now shop around the clock at NKD easier and faster from home. But not just that: Even on the road in future everything is far more user-friendly. Because the NKD Online Shop promises a much improved use on smartphones and tablets, thus there is nothing in the way of a shopping trip with these terminal devices. Further plus points are daily changing offers, attractive prices and an availability summary. Under “myNKD” customers can find their personal account with the general order overview. Additional service-features for the category are already in planning. With flexible payment options customers can decide in future, which payment method suits them best. Once found, the new favorite products can be conveniently delivered to home or free of cost to the next NKD store. Who signs up for the newsletter never misses attractive promotions, competitions and special prizes again. The new website is communicated with eye-catching attention in the stores, via print advertisement and weekly newspapers, the newsletter as well as via Facebook and Instagram. Besides the relaunch there is a further success message from the online-division of the company: Deutschland Test and ServiceValue award NKD with the quality label BESTER ONLINE-SHOP 2018 for the present NKD Online Shop. In the framework of a customer-satisfaction-survey of both the institutes more than 1,500 Online-Shops in Germany were tested; more than 600,000 customer opinions were obtained. The survey depicts the according consumer view regarding the Online-Shops under consideration of the purchase decision. The entire survey and results was published by the magazine FOCUS (Magazine 21/18). 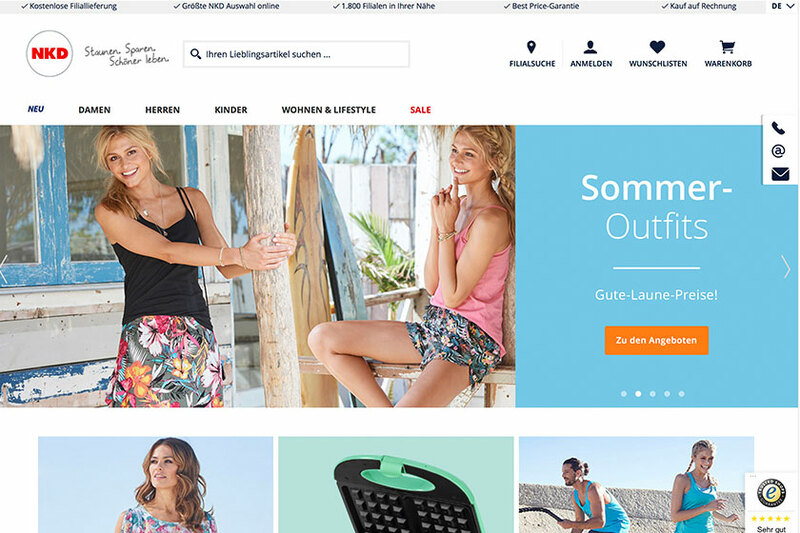 With a total of 1,800 stores in Germany, Austria, Italy, Slovenia and Croatia, its own online shop such as around 8,000 employees worldwide, the NKD Group is one of the largest companies in the textile retail sector. The offer ranges from current fashion for the whole family and functional sportswear to home textiles and seasonal decorative items to selected brand assortments.